SIR: I have the honor to report that the brigade under my command, in common with the rest of the division, left Washington at 3 o'clock p.m. on Tuesday, July 15; encamped that night at Annandale; occupied Fairfax Court-House, and encamped there on Wednesday. On Thursday, July 17, proceeded to Centreville, where we remained till Sunday morning, July 21, when the whole Army took up its line of march to Bull Run. Nothing of moment occurred till the arrival of the division at the crossing of Bull Run, about 9.30 o'clock, when intelligence was received that the enemy was in front with considerable force. The brigade was ordered to halt for a supply of water and temporary rest. Afterwards an advance movement was made, and Colonel Slocum, of the Second Rhode Island Regiment, was ordered to throw out skirmishers upon either flank and in front. These were soon confronted by the enemy's forces, and the head of the brigade found itself in presence of the foe. The Second Regiment Rhode Island Volunteers was immediately sent forward with its battery of artillery, and the balance of the brigade was formed in a field to the right of the road. At this time, much to my sorrow, I met you retiring from the field, severely wounded, and was requested to take charge of the formation of the division in the presence of the enemy. Finding that the Second Regiment Rhode Island Volunteers was closely pressed by the enemy, I ordered the Seventy-first Regiment New York Militia and the Second Regiment New Hampshire Volunteers to advance, intending to hold the First Regiment Rhode Island Volunteers in reserve. But owing to delay in formation of the two former regiments, the First Rhode Island Regiment was at once ordered on the field of action. Major Balch, in command, gallantly led the regiment into action, where it performed most effective service in assisting its comrades to repel the attack of the enemy's forces. The Second Rhode Island Regiment of Volunteers had steadily borne the enemy's attack, and had bravely stood its ground, even compelling him to give way. At this time Colonel Slocum fell mortally wounded, and soon after Major Ballou was very severely injured by a cannon ball, that killed his horse and crushed one of his legs. The regiment, under command of Lieutenant-Colonel Wheaton, continued gallantly to hold its position. Soon after, Colonel Martin, of the Seventy-first Regiment New York State Militia, led his regiment into action, and planting the two howitzers belonging to the regiment upon the right of his line, worked them most effectively against the enemy's troops. The battery of the Second Rhode Island Regiment, on the knoll upon the extreme right, was used in silencing the heavy masked battery of the enemy in front, occasionally throwing in shot and shell upon the enemy's infantry, six regiments of which were attempting to force our position. Captain Reynolds, who was in command of this battery, served it with great coolness, precision, and skill. The Second Regiment New Hampshire Volunteers, under Colonel Marston, was now brought into the field, and rendered great service in defending the position. 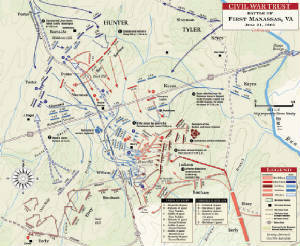 Colonel Marston was wounded early in the action, and Lieutenant-Colonel Fiske ably directed the advance of the regiment. Thus my whole brigade was brought into the engagement at the earliest possible moment, and succeeded in compelling the enemy to retire. We were wholly without support, bearing the brunt of the contest, until relieved by Major Sykes, of the Third [Fourteenth] Infantry, U.S. Army, who formed his battalion most admirably in front of the enemy, and pouring in a destructive fire upon his lines, assisted in staggering him. At that moment, after the fight had continued an hour or more, Colonel Heintzelman's division was seen marching over the hill opposite our left flank, and attacking the enemy at that point, the opposing force was soon dispersed. This point being gained, and the enemy retiring in confusion before the successful charge of Colonel Heintzelman's division, I withdrew my brigade into the woods in rear of the line, for the purpose of supplying the troops with ammunition, which had become well-nigh exhausted. The Second Regiment New Hampshire Volunteers was sent forward to assist one of Colonel Heintzelman's brigades, at that time three-quarters of a mile distant, and driving the enemy before them. The battery of the Second Rhode Island Volunteers' changed its position into a field upon the right, and was brought to bear upon the force which Colonel Porter was engaging. The enemy's infantry having fallen back, two sections of Captain Reynolds' battery advanced, and succeeded in breaking the charge of the enemy's cavalry, which had now been brought into the engagement. It was nearly 4 o'clock p.m., and the battle had continued for almost six hours since the time when the Second Brigade had been engaged, with everything in favor of our troops and promising a decisive victory, when some of the regiments engaging the enemy upon the extreme right of our line broke, and large numbers passed disorderly by my brigade, then drawn up in the position which they last held. The ammunition had been issued in part when I was ordered to protect the retreat. The Seventy-first Regiment New York State Militia was formed between the retreating columns and the enemy by Colonel Martin, and the Second Regiment Rhode Island Volunteers by Lieutenant-Colonel Wheaton. The First Regiment Rhode Island Volunteers moved out into the field at the bottom of the gorge near the ford, and remained for fifteen minutes, until a general retreat was ordered. The regiment then passed on to the top of the hill, where it was joined by the remainder of the brigade, and formed into column. Large bodies of stragglers were passing along the road, and it was found impossible to retain the order which otherwise would have been preserved. Yet the brigade succeeded in retiring in comparatively good condition, with Arnold's battery of artillery and Captain Armstrong's company of dragoons bringing up the rear. The retreat continued thus until the column was about emerging from the woods and entering upon the Warrenton turnpike, when the artillery and the cavalry went to the front, and the enemy opened fire upon the retreating mass of men. Upon the bridge crossing Cub Run a shot took effect upon the horses of a team that was crossing. The wagon was overturned directly in the center of the bridge, and the passage was completely obstructed. The enemy continued to play his artillery upon the train, carriages, ambulances, and artillery wagons that filled the road, and these were reduced to ruin. The artillery could not possibly pass, and five pieces of the Rhode Island Battery, which had been safely brought off the field, were here lost. Captain Reynolds is deserving of praise for the skill with which he saved the lives of his men. The infantry, as the files reached the bridge, were furiously pelted with a shower of grape and other shot, and several persons were here killed or dangerously wounded. As was to be expected, the whole column was thrown into confusion, and could not be rallied again for a distance of two or three miles. The brigade reached Centreville at 9 o'clock p.m., and entered into the several camps that had been occupied the night before, where the brigade rested until 10 o'clock, when, in pursuance to orders from the general commanding, the retreat was continued. The column reached Washington about 9 a.m. Monday morning, when the several regiments composing the brigade repaired to their respective encampments. In the movements of my brigade upon this unfortunate expedition I was greatly assisted and advised by his excellency Governor Sprague, who took an active part in the conflict, and who was especially effective in the direction and arrangement of the battery of light artillery attached to the Second Rhode Island Volunteers. It would be invidious to mention officers of the different corps who distinguished themselves upon the field for coolness and bravery. Where all performed their duty so well, I cannot feel justified in specifying particular instances of fidelity. The officers and men were prompt, steady, and brave, and performed the several parts assigned to them in the most gallant manner. Our loss has been very severe. The Second Regiment particularly suffered greatly. The death of Colonel Slocum is a loss not only to his own State, which mourns the death of a most gallant and meritorious officer, who would have done credit to the service, while his prominent abilities as a soldier would have raised him high in the public estimation. He had served with me as major of the First Regiment Rhode Island Volunteers, and when he was transferred to a more responsible position I was glad that his services had been thus secured for the benefit of his country. His associate, Major Ballou, of the same regiment, was deserving of the highest commendation as a brave soldier and a true man. Captain Tower, of the Second Regiment Rhode Island Volunteers, received his death-wound at the very commencement of the battle. He was young, a brave and promising officer, who is deeply lamented by his comrades and friends. Captain Smith, of the Second Regiment Rhode Island Volunteers, was known among us for his many good qualities of head and heart. Lieutenant Prescott, of the First Rhode Island Regiment, was also killed in the early part of the action, while gallantly encouraging his company. He was a noble-hearted Christian man, whose memory will be ever fresh in the hearts of his friends. Among those who are missing I have to mention the names of Lieutenant Knight, of the First Regiment Rhode Island Volunteers, and Dr. James Harris, of the same regiment. Both were men whom we can hardly afford to lose, and I trust that some measures may be taken by which their fate may be known. Dr. Harris was especially active upon the field of battle in dressing the wounds of the disabled soldiers, and, knowing no distinction between friend and foe, treated the enemy's wounded men with the same kindness and consideration as those of our own troops. He is probably a prisoner. Other officers might be mentioned had I the data at hand to specify, but I have not yet received reports from the Seventy-first New York and Second New Hampshire Volunteers. I append a list of casualties so far as reports have been received. 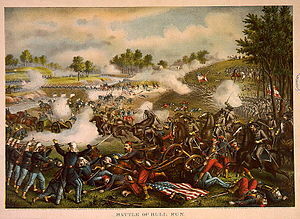 COLONEL: You will observe that my report of the movements of my brigade at Bull Run on the 21st ultimo is dated July 24, but three days after the battle. It was made out in the rough on that day, and the next morning (25th) orders came to my camp directing me to get my First Rhode Island Regiment in readiness to leave for Providence on the 7 p.m. train. The work incident to moving a regiment with its baggage so occupied me that I had no time to revise my report, but sent it in as it was, intending at my leisure to make a supplementary one. It will not seem strange that many omissions and some inaccuracies should have occurred, which I now hope to correct. I stated that after Colonel Hunter was wounded he directed me to "take charge of the formation of the division in the presence of the enemy," when I should have said, that part of the division in presence of the enemy. I, of course, knew that you commanded the division by virtue of your superior rank; but you were at that time, as you will remember, in command of your brigade, which you were just bringing into action. In another part of my report I mention the arrival of Colonel Heintzelman's division on our left. It was Sherman's brigade, with the Sixty-ninth New York Militia in advance, that arrived at about 12.30 o'clock, and by a most deadly fire assisted in breaking the enemy's lines, and soon after 1 o'clock the woods on our front, which had been so obstinately held, were cleared of the enemy. My brigade had now been engaged since about 10.30 o'clock. In my first report I mentioned the opportune arrival of Major Sykes' battalion. I beg to again mention the bravery and steadiness manifested by Colonel Martin and his entire regiment, Seventy-first, both-on the field and during the retreat. Colonel Marston, of the Second New Hampshire, was badly wounded in the shoulder, but, notwithstanding, he remained in the saddle under fire after his wound was dressed, his horse being led by his orderly. The regiment under charge of Lieutenant-Colonel Fiske conducted itself most gallantly. Both officers and men deserve great praise. Of the two Rhode Island regiments I have already spoken more fully, but cannot close this without again attesting to the admirable conduct of Lieutenants-Colonel Wheaton, of the Second Regiment, and Majors Balch and Goddard, of the First, with the staff and company officers and men of both regiments. No troops could have behaved better under fire. By an omission in copying my first report the name of Capt. William L. Bowers, quartermaster First Rhode Island Regiment, who is reported missing, was not mentioned. He was a brave and efficient officer, whom I could ill afford to lose. I have good reason to hope that he is alive in the hands of the enemy, and well cared for. Since my original report I have learned that some others of our missing are in Richmond; among them Lieutenant Knight and Dr. Harris, of the First Rhode Island Regiment. I beg to supply an important omission in my first report, by attesting to the courage and efficiency of my personal staff, Chaplain Woodbury, of the First Rhode Island Regiment, aide-de-camp; Lieutenant and Adjutant Merriman, First Rhode Island Regiment, A. A. A. G., and Lieutenant Beaumont, U.S. Cavalry, aide-de-camp, who were all active in their assistance on the field. Lieutenant Beaumont being in the regular service, I beg to recommend him to the notice of the commanding general as a most gallant and deserving young officer. Captain Curson, Seventy-first New York, division quartermaster, and Captain Goodhue, Second New Hampshire, division commissary, rendered most efficient service in their departments. Captain Reynolds' battery did such good service in so many parts of the field that it has a place in several reports, which renders it unnecessary for me to make further mention of it.